As noted in the commentary from last week the extreme drop in the Western Young Cattle Indicator (WYCI) righted itself somewhat this week, staging an 11% recovery to close at 595¢/kg cwt. The Eastern Young Cattle Indicator (EYCI) largely trekked sideways with a slightly softer bias, down only 0.5% to match the WYCI at 595¢/kg cwt. The 90CL frozen cow beef export indicator continued to slide this week, dragged down by a reduction in boxed beef forward sales in the US over the last few weeks. US meatworks report an 18% drop in forward bookings so have realigned their pricing to lower levels in order to attract additional forward sales interest. The 90CL settling 3.1% softer to close at 615¢/kg CIF – Figure 1. National cattle indicators were largely supported by gains in Queensland this week with most categories broadly unchanged. National Medium Steers the standout performer, up .2% to 293¢/kg lwt. National Feeder Steers, the laggard this week as the lift in grain prices continue to bite, staging a 1.5% fall to 318¢/kg lwt. 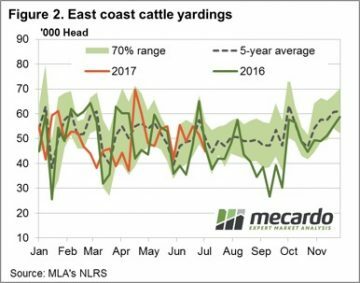 East coast producers responding to the recent price declines with a further pullback in yardings noted this week to see just short of 45,000 head reported through the saleyards– Figure 2. Weekly throughput is now sitting 10.9% below the five-year average for this time of the season. 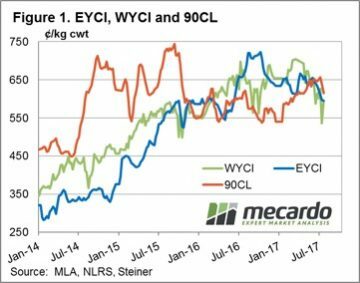 Despite the fall in the 90CL this week the indicator remains above the EYCI, combined with the steady decline in cattle yardings, this should start to add some support to cattle prices at the current level. Although, the rain forecast for next week shows limited falls to the southern tip of the nation so it’s unlikely that prices will get too much of a kick up. Consolidation at current levels seems the order of the day.